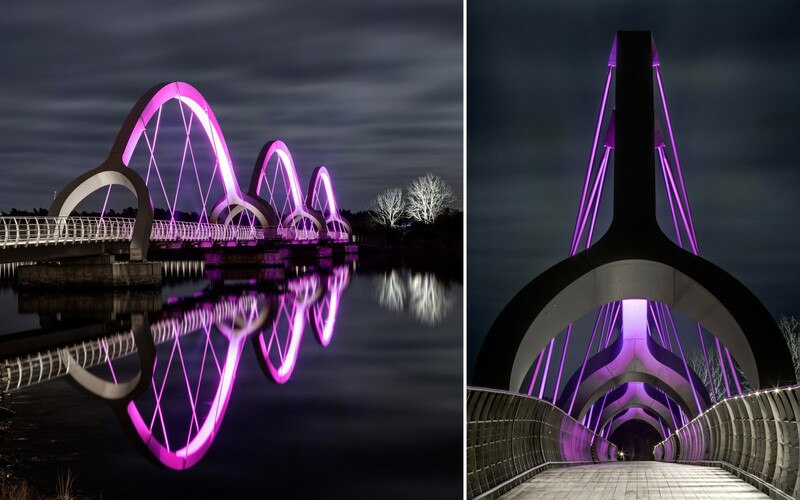 At 756 meters long, the Sölvesborg Bridge is currently the longest bicycle and pedestrian bridge in Europe. Designers Ljusarkitektur used Lumenpulse LED fixtures to enhance the bridge’s landmark status, without impacting the local habitat. 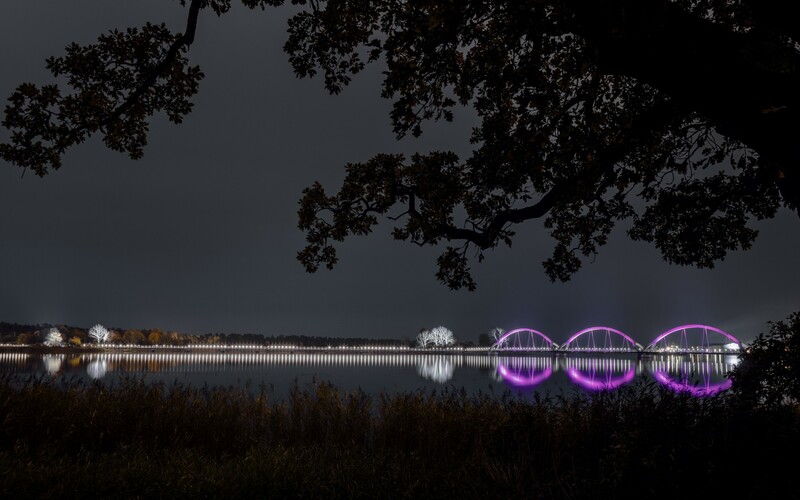 Swedish design firm Ljusarkitektur used Lumenfacade luminaires to illuminate the longest bicycle and pedestrian bridge in Europe, with careful consideration for the area's rich wildlife. 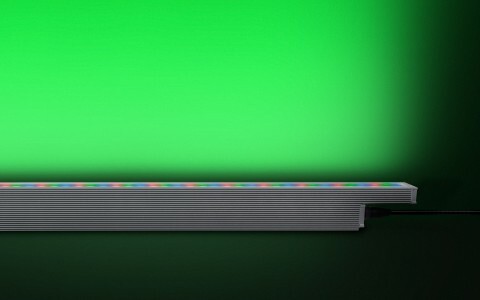 We’ve had good experiences with Lumenpulse on previous projects, and when tested, their fixtures delivered the results we wanted. 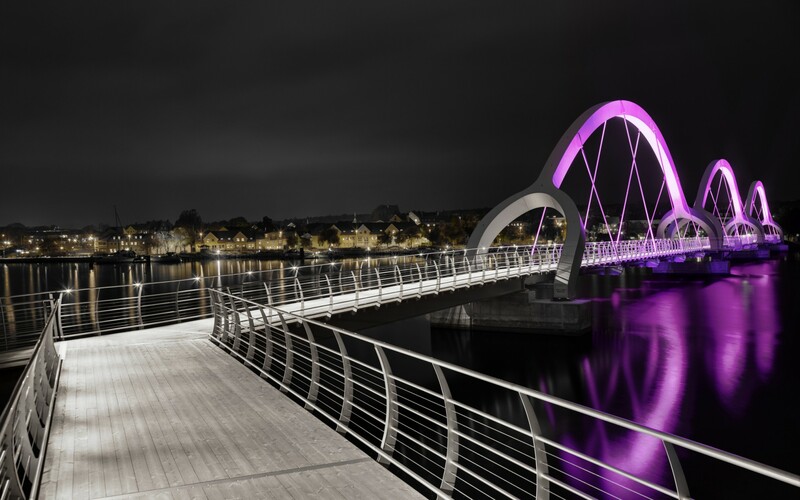 Built in 2012, the Sölvesborg Bridge reaches across the bay of Sölvesborg, connecting the center of this sleepy Swedish town with a new housing district. At 756 meters long, it is the longest bicycle and pedestrian bridge in Europe, its three distinctive support arches - made from over 150 tons of duplex stainless steel - visible from a great distance. Working closely with the municipality, design firm Ljusarkitektur set out to develop a lighting scheme that would enhance the bridge's landmark status, without leaving a negative impact on the local habitat. "We always work from the human perspective and experience, but in this case the surrounding natural area was also important to consider. There is a rich birdlife in the area that we didn't want to disturb," says Lina Färje, lighting designer at Ljusarkitektur. In order to be as inconspicuous as possible, Ljusarkitektur turned to Lumenpulse LED technology. 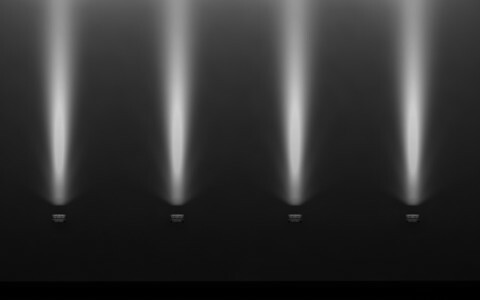 "We've had good experiences with Lumenpulse on previous projects, and when tested, their fixtures delivered the results we wanted," Färje says. The firm selected just 24 Lumenfacade Color Changing luminaires with a narrow optic to graze the suspension cables and light the distinctive arches. The fixtures were mounted on the outside of the bridge, to the bottom of the cables. 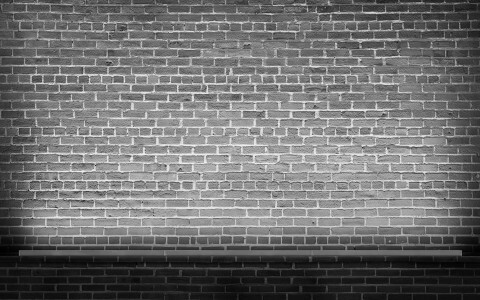 To hide the light sources and shield pedestrians and residents from glare, the firm designed deep, custom glare shields. "We worked to create a subtle lighting on the inside of the arches, but we also enhanced the nature around it, lighting the trees and reeds at special points and working with reflections in the water," Färje says. Fittingly, Ljusarkitektur looked to the area's wildlife for further inspiration, exploiting the fixtures' flexibility and controllability to program different color sequences throughout the year. "Colours are preprogrammed for different scenarios inspired by the birdlife in the area. There are also special scenarios for different events in the city," Färje says. 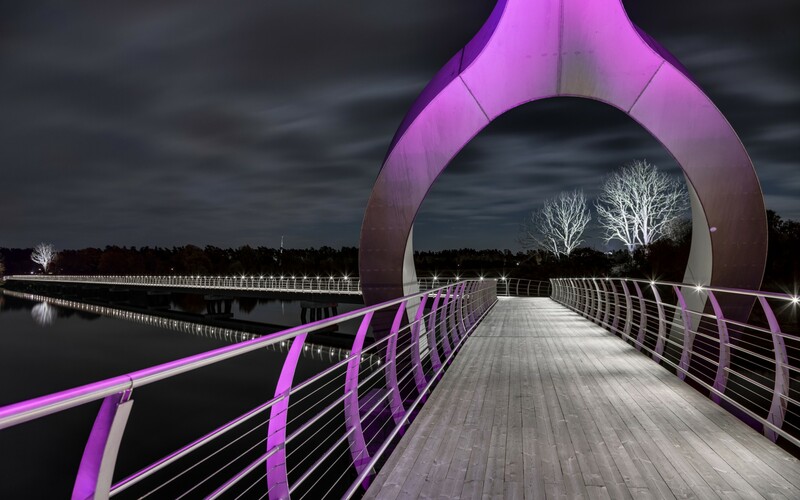 Managing to be both dynamic and understated, the lighting design has turned the bridge into an attraction for tourists, and even given residents a new perspective on their town. "There has been a very positive response," Färje says, "It helps people experience the city in a different way."